As I write this, British multinational pharmaceutical company GlaxoSmithKline is conducting a study in my backyard. By backyard, I mean the Province of Quebec, an admittedly large yard by anyone’s standards: 1.5 million km2 (almost 600,000 mi2) in total area. But this is where GlaxoSmithKline is conducting its retrospective cohort study, with preliminary results to be revealed in “early 2014”1. What are they studying? Whether or not their H1N1 flu vaccine Arepanrix, which was administered to Quebecers during the 2009-2010 H1N1 pandemic, was associated with a higher incidence of narcolepsy. A retrospective cohort study is when a research group looks at the medical files of groups of individuals who are alike in many ways but differ on a particular point (e.g. teenagers who were immunized by Arepanrix versus comparable teenagers who were not) to see if they have a different outcome (e.g. narcolepsy). What prompted GlaxoSmithKline to conduct this investigation has nothing to do with Quebec but rather with Scandinavia. The story begins (if any story can be said to really ever begin) with a statement by Sweden’s Medical Products Agency (MPA) in August 20102. The MPA communicated to the public that it had received six reports from clinicians on a possible association between the H1N1 vaccine Pandemrix and narcolepsy. Pandemrix was a vaccine manufactured in Germany by GlaxoSmithKline and designed to immunize European populations against the H1N1 strain of the influenza virus. Swedish clinicians were reporting an increase in the incidence of narcolepsy in 12-to-16-year-old Swedes within two months of having received the shot. At the time, 30 million Europeans had already received this vaccine. A similar realization was striking neighbouring Finland, which led to that country’s National Institute for Health and Welfare recommending that Pandemrix be discontinued until the phenomenon had been properly studied. A year later, the European Medicines Agency issued a report following its review of the case3. Its conclusion was that the benefits of inoculating people with Pandemrix still outweighed the risks, but that individuals under the age of 20 should only be vaccinated with Pandemrix if “the recommended annual seasonal trivalent influenza vaccine is not available and if immunization against H1N1 is still needed, for instance in people at risk of the complications of infection”. It remarked that the incidence of narcolepsy in immunized adults had not increased (narcolepsy “naturally” appears in 10 new individuals for every million people every year); however, the incidence had increased by 6-to-13 fold in vaccinated children and adolescents, leading to 3-to-7 more cases per 100,000 vaccinated youths. So why weren’t adults affected? In January 2013, Yale University School of Medicine neurologist and president of the New England Skeptical Society Steven Novella summarized on his blog Science-Based Medicine the complicated and sometimes contradictory evidence in the case linking Pandemrix to narcolepsy4. While a recent report had found evidence of this link in Finland and Sweden, no such link could be found in Denmark, Italy, France, the Netherlands, Norway, or the United Kingdom, despite Pandemrix having been used in all of these countries. So why was Pandemrix supposedly triggering narcolepsy in Swedish and Finnish youths but not in Danish, Italian, French, Dutch, Norwegian, or UK children and adolescents? Dr. Novella speculated that increases in narcolepsy in the two Scandinavian countries could be due to the inactivated flu virus in Pandemrix… or to its adjuvant ASO3… or to exposure to the H1N1 virus itself… or a combination of some of the above… or perhaps even because of other infections. It cannot be that a vaccine alone triggers the symptoms of narcolepsy in two countries but not in six others. The answer has to be at least more nuanced if not revised entirely. Two months later, the Centers for Disease Control in the United States issued a statement in which they set the record straight for Americans5. Pandemrix was never used in the U.S.: “no adjuvanted influenza vaccines are licensed in the United States, and no adjuvanted influenza vaccines were used in the United States during the influenza pandemic or in any other influenza season.” The CDC stated that it was sponsoring an international study into the link between Pandemrix immunization in Europe and narcolepsy which it estimated would be completed in 2014. Last November, Canadian television station CTV did a Q&A with GlaxoSmithKline in the context of its programme W51. Pandemrix was never used in Canada, but an “equivalent” vaccine called Arepanrix was administered to Canadians during the 2009-2010 epidemic. GlaxoSmithKline was also the manufacturer, but this particular vaccine was produced in Sainte-Foy, Quebec, not in Germany. GlaxoSmithKline confirmed that all Pandemrix doses had expired and that Arepanrix’s temporary, one-year license in Canada had run out in October of 2010. It stated that no plausible biological mechanism explaining how its H1N1 vaccines could lead to narcolepsy had been proposed; nevertheless, it was conducting a retrospective cohort study in Quebec, the preliminary results of which would be released in early 2014. The authors report a peak in April-July for the past fifteen years. Together with earlier data, this suggests that winter airway infections act as triggers for narcolepsy. The authors hypothesize that these infections either initiate or reactivate an immune response that results in the loss of the hypocretin cells. The reason why narcolepsy would declare itself in the spring and not during flu season per se would be explained by the fact that 80% of cell loss is required for symptoms to appear, and this loss does not happen overnight. 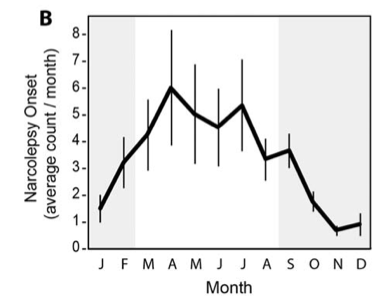 Incidence of narcolepsy in China during the H1N1 outbreak not only followed this cyclical wave, but it skyrocketed, too: 3.2 to 3.7 fold greater than predicted. Could the vaccine be to blame? The authors note, “The majority (96%) of new narcolepsy patients in 2010 did not report a prior H1N1 vaccination”. No dice. In the first part of this series, I mentioned that scientists have finally found a white blood cell that targets hypocretin, the loss of which seems to be inexorably tied to narcolepsy. This cell only does so when hypocretin is presented to it by a mutated HLA protein, so this autoimmunity phenomenon is rooted in genetics. If you have a specific mutation in your HLA gene, you may be at a much higher risk of developing narcolepsy. But what transforms this risk into a reality? What actually triggers this dormant risk? The group which recently reported on this hypocretin-targeting white blood cell tested the H1N1 virus, to see if the same blood cell that recognizes hypocretin as “bad” would act similarly for parts of the H1N1 influenza virus itself. Lo and behold, they did find that part of the virus triggered a similar reaction in this highly specialized cell. This is one more piece of evidence pointing in the direction that infectious agents may trigger the onset of narcolepsy in genetically-predisposed individuals. The Nature News piece that summarized these recent findings had a great quote from Gert Lammers, a neurologist working at Leiden University Medical Center in the Netherlands: “The results are very important, but they need to do a replication study in a large group of patients and controls.”7 Indeed, while this is all very exciting, replication in science is key. When one paper demonstrates that A leads to B, the public should say, “Hmm, interesting.” When four independent papers demonstrate the same thing, it’s time to pop the cork on the champagne bottle. There are still many unknowns in this narcolepsy story. I could not find a single study that tried to replicate what the Chinese did with regards to the incidence of narcolepsy as a function of the seasons. At the time of this writing, this is the only known study that looked at this. More work is needed to determine if onset of narcolepsy in other countries also peaks in the spring and early summer. As for the H1N1 vaccines, we should expect the results of the on-going studies later this year. An unbiased study in Québec led by the Ministère de la Santé et des Services Sociaux (Ministry of Health and Social Services) would certainly be welcomed; I could not find information other than GlaxoSmithKline itself is looking into this which, while helpful for the company, does invite a tremendous bias to the table. It is still possible that the vaccines played a role in the increased incidence of narcolepsy, but it would most likely be minimal, if there at all. Still, the Finnish and Swedish health agencies are to be commended for withholding the vaccine when alarming evidence surfaced. When vaccines seem to pose a real danger, governmental agencies act accordingly. In the case of narcolepsy, however, the real culprit may be the virus itself. 1. W5. “GlaxoSmithKline’s full statement to W5 on Pandemrix.” Accessed January 4, 2014. http://www.ctvnews.ca/w5/glaxosmithkline-s-full-statement-to-w5-on-pandemrix-1.1524407#. 2. Läkemedelsverket: Medical Products Agency. “The MPA investigates reports of narcolepsy in patients vaccinated with Pandemrix.” Accessed January 4, 2014. http://www.lakemedelsverket.se/english/All-news/NYHETER-2010/The-MPA-investigates-reports-of-narcolepsy-in-patients-vaccinated-with-Pandemrix/. 3. European Medicines Agency. “Questions and answers on the review of Pandemrix Influenza vaccine (H1N1) (split virion, inactivated, adjuvanted) A/California/7/2009 (H1N1)v like strain (X- 179A): Outcome of a procedure under Article 20 of Regulation (EC) No 726/2004.” Accessed January 4, 2014. http://www.ema.europa.eu/docs/en_GB/document_library/Medicine_QA/2011/07/WC500109183.pdf. 4. Steven Novella. “Pandemrix and Narcolepsy.” Accessed January 4, 2014. http://www.sciencebasedmedicine.org/pandemrix-and-narcolepsy/. 5. The Centers for Disease Control and Prevention. “CDC statement on narcolepsy following Pandemrix influenza vaccination in Europe.” Accessed January 4, 2014. http://www.cdc.gov/vaccinesafety/Concerns/h1n1_narcolepsy_pandemrix.html. 7. Ed Yong. “Narcolepsy confirmed as autoimmune disease.” Accessed January 3, 2014. http://www.nature.com/news/narcolepsy-confirmed-as-autoimmune-disease-1.14413. Tags: biology, criticism, doctor, education, flu, H1N1, health, medicine, narcolepsy, research, vaccines. Bookmark the permalink.